This is a well-written synopsis of the history and our current state of thinking about what constitutes a Good Death. The first thing that drew me in was her frequent quotation or reference to people I have come to respect – Ira Byock, Christina Puchalski, Balfour Mount, Cicely Saunders, Allan Kellehear, Atul Gawande, Harvey Chochinov, Bill Breitbart – to mention a few. The second was that the text was brief, to the point, and well referenced. The book is divided into three sections. The first is about how we think about death and dying, then and now, what constitutes a good death, and what influence the hospice/palliative care movement may have had. 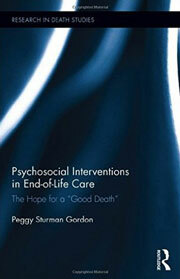 The second section is about psychosocial interventions that may promote a good death. I didn’t think there was anything radically new here, but it was interesting to see the results of various interventions that have been trialed. The final section is about What Promise Exists for a Good Death? The author briefly discusses euthanasia and physician-assisted suicide, suggesting that there are good arguments on both sides of the discussion, with which I actually agree. But what she does not discuss is the reports from the country where this has been trialed – one thousand patients a year euthanized without request (never mind consent), euthanasia for patients with potentially treatable/reversible conditions like depression, euthanasia for minors, and more recently an exponential increase in patients subject to terminal sedation. The bulk of this section is a good review of attitudes to dying, particularly from the perspectives of patients and providers, and what might be done to improve things. I would recommend this book to anyone who works in palliative care as a good summary of where we are at in looking after the patient’s interests. Which is what we are meant to be doing. And who is Peggy Sturman Gordon? Strangely, the book gives no information whatsoever, but Amazon informs me ‘She received her second Master’s degree in Thanatology from Brooklyn College. In addition, she is a trained art and horticultural therapist and has worked with the geriatric population for more than a decade.’ I think working with her in the garden would be enjoyable. 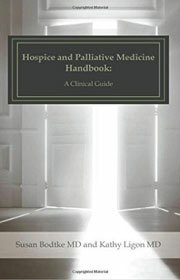 This is a handbook for doctors and other healthcare professionals who work in palliative care. It is written by two doctors who are board-certified in palliative medicine and are now hospice directors. It is set out as 65 topics from Adjuvant pain therapy to Wounds. Except for a small number of tables, the whole text is set out as bullet-point lists; some treatment algorithms would be a worthy addition. It is designed to provide quick reference to material that will help in decision-making in trying to provide optimal care. 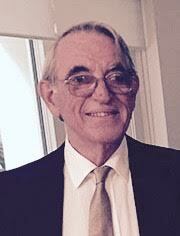 I perused a number of topics and thought they provided reasonable detail and were well set out. I think this book would be a useful reference in the office of a palliative care ward or home care service.